I really, really like this new three year series, though am disappointed that the actual stamp cuts out so much of the bird's features. It would have been nice if the souvenir sheets had the extras perforated as well so you had the option of including them. This was last year's (2016) issue of Birds of Canada which feature such birds that I have never seen as the Sharp Tailed Grouse that live in Saskatchewan, the Great Horned Owl from Alberta, the Puffin who live off the coast of Newfoundland and Labrador, a Rock Ptarmigan from Nunavut, and a Common Raven - one I have seen, though not in Yukon where this is the provincial bird. Except for the Great Horned Owl, all of these birds were in contention for the National Bird Project and all of them lost out to the Gray Jay (also known as Whiskey Jack). This was only a recommendation by the Canadian Geographic Society. We still don't have an official bird of Canada. 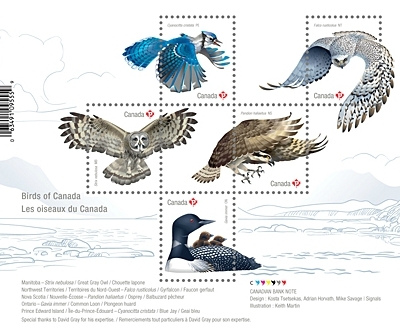 Again, in a clockwise flight from upper left: the Blue Jay, this one from Prince Edward Island, a Gyrfalcon from the Northwest Territories, an Osprey in Nova Scotia, a Common Loon from Ontario, and finally, a Great Grey Owl representing Manitoba. ...the Loon is my favorite! The puffin, blue jay, raven and common loon are my favourites. But any bird is a flying miracle of course. 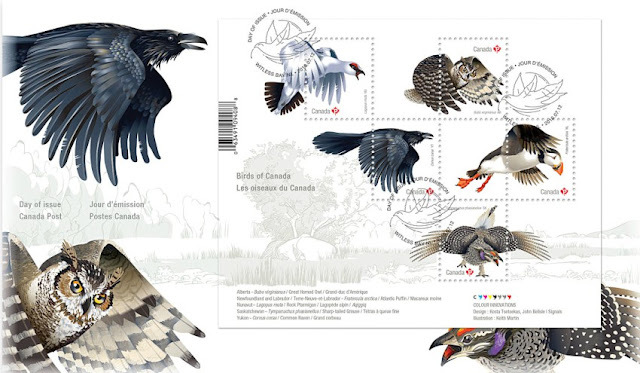 These are magnificent - I'm a fan of bird stamps anyway. Gorgeous, especially the wings. The scissors as recommended by Heleen or a sharp edge would definitely be the answer. My favourite is the first sheet, I wouldn't be able to tear that one apart. What a clever way to cover A and B. Both sheets are beautiful - I agree with Joy, I'd find it hard to cut up a sheet for sure. Interesting post. Lovely bird sheets. Any stamps with birds are good by me.